Vegan, no-bake, quick & easy. 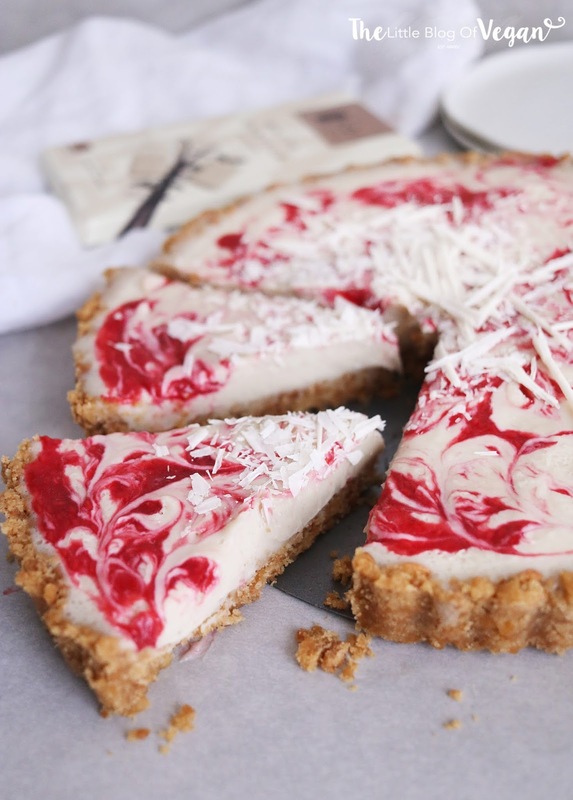 There's something about the combination of white chocolate and raspberry which screams spring/summer to me! 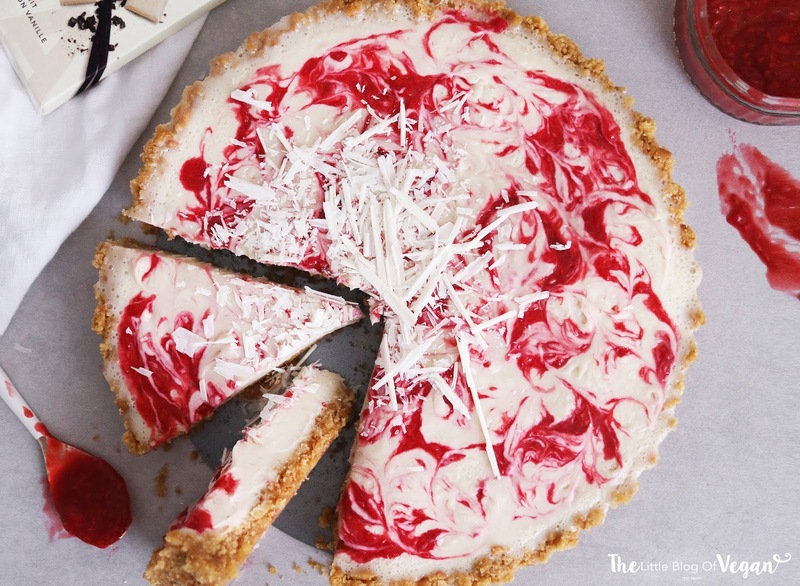 A quick & easy, yet flavourful dairy-free white chocolate tart with a crumbly biscuit base and a delightful raspberry swirl, perfect for any occasion. This tart is quick & easy to make, vegan and is utterly irresistible. You're sure to go in for a second serving!! 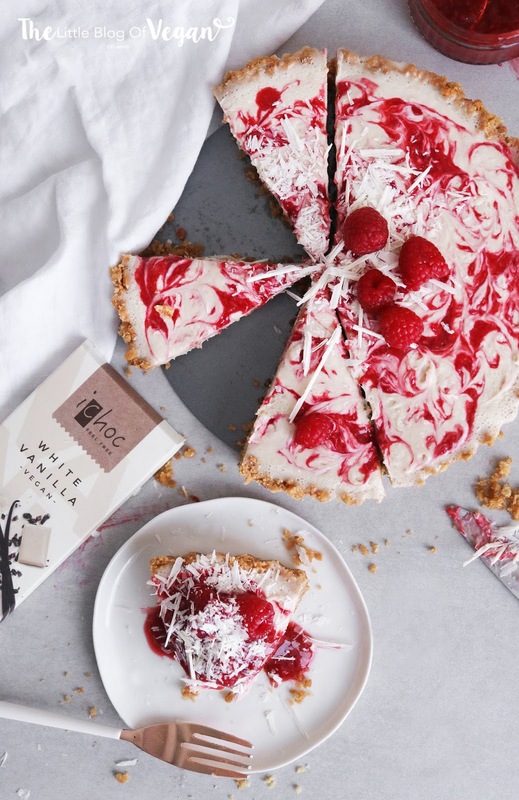 I used the scrumptious iChoc 'White Vanilla' chocolate in this tart. It's a silky vanilla chocolate which makes for the most delicious and creamy treat! I paired it with a swirl of raspberry compote which adds a divine tartness to this dessert, as well as looking stunning! It makes it extra special. Step 1- Line a tart tin with greaseproof paper. Place into the fridge or freezer whilst you make the filling. Step 1- Open a can of coconut milk, drain the clear liquid part and only use the thick white cream. Step 2- Place the cream and chocolate into a medium-sized saucepan, and heat on medium until the combined. Allow to sit for a few minutes then stir together. The cream will melt the chocolate. Step 3- Pour the filling onto the crust and level with a spoon or offset spatula. 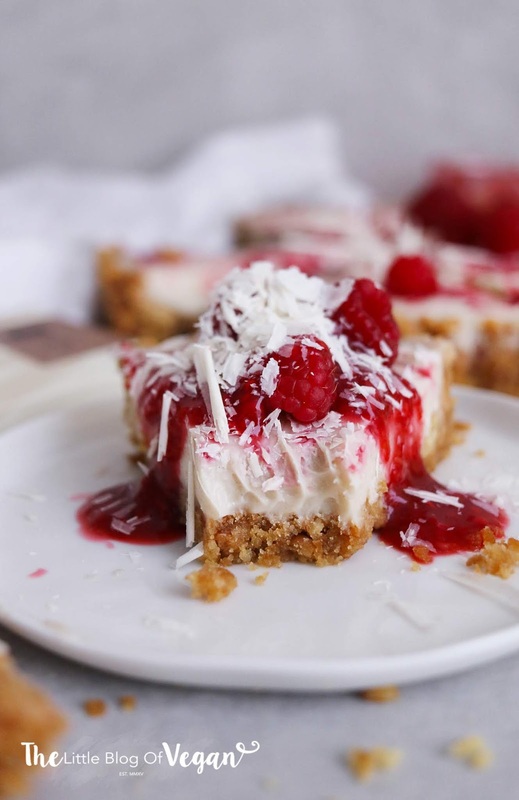 Place into the fridge whilst you make the raspberry topping. Step 1- Place the raspberries into a medium-sized saucepan, adding in the lemon juice. Step 2- Simmer on low until the raspberries begin to soften, then mash with a fork. Once cooked, leave it to cool, then pop it into the fridge for 30 minutes to thicken. Step 3- Swirl the raspberry compote over the tart. I used a toothpick. Place into the freezer for 2-3 hours, or until set. 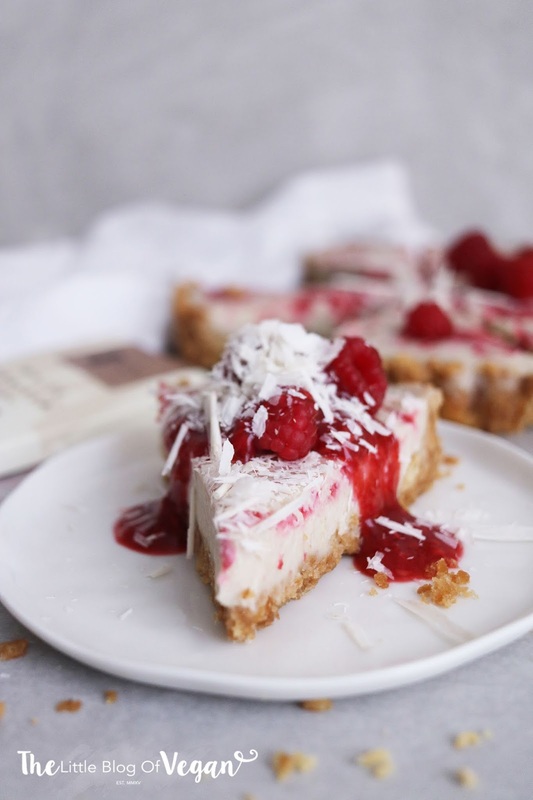 I served my tart with fresh raspberries and white chocolate shavings. Store in a sealed container in the freezer and best eaten within a few days. YUM! 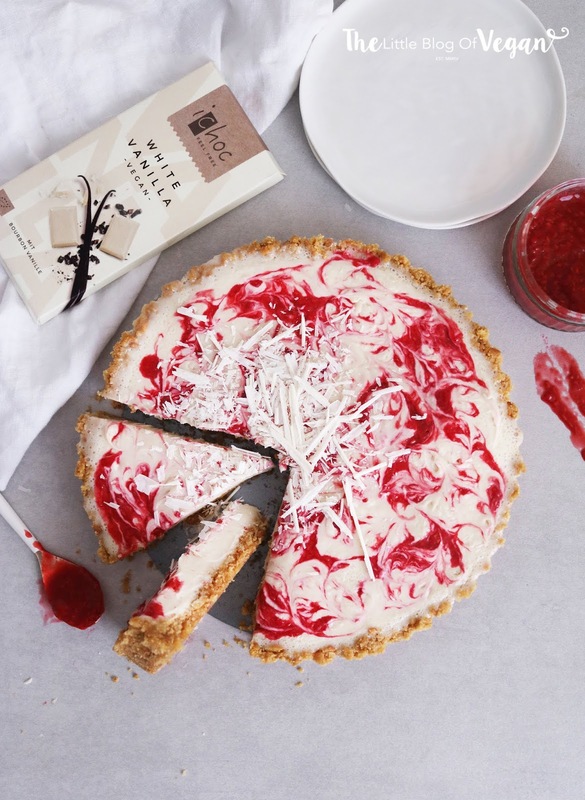 I love white chocolate and raspberry together! 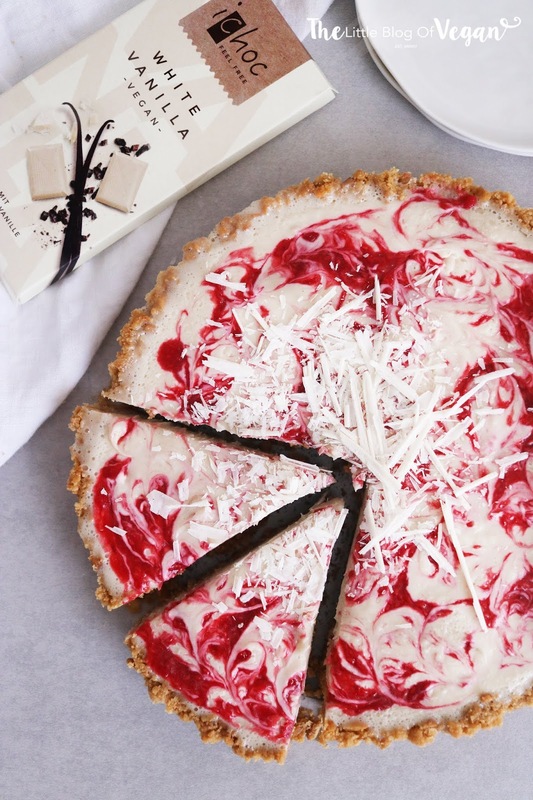 This tart looks perfect! What a nice treat for early summer days like today. Thank you for sharing the recipe!